According to Roland Emmerich, director of such fine films as Independence Day and The Day After Tomorrow, the world ends like this: the American government, having failed to heed warnings about imminent alien invasion / global warming / ancient doomsday prophecy, finds itself presiding over a global holocaust. A torrent of nuclear-scale destruction rains down (the White House inevitably destroyed via laser or tsunami), and when the smoke clears, a handful of scrappy survivors come together for a last-ditch effort to restore the status quo. Enter Will Smith in a Range Rover. Or Jake Gyllenhaal in a frozen cargo freighter full of wolves. Or John Cusack in a motor home. Such quaint imaginings were once the bread and butter of the multiplex. Independence Day raked in over $800 million in 1996. The Day After Tomorrow took in around $540 million in 2004. But that was five years and several bailouts ago. In succeeding years, global warming has gone from a sidebar to a headline. Evidence of secret Iranian nuclear facilities has soured our Cold War romanticism. From healthcare to finance, the prefix "broken" has been applied to every industrialized system humankind has had the gumption to design. When Emmerich's 2012 opens on Nov. 13, the world that lapped up his last two end-time fables might not be so eager for part three. Think back to those cargo-ship wolves. They were silly at the time. Today, they're downright insulting. From Al Gore's Inconvenient Truth to the glut of green literature, humanity has now learned more about climate change than we ever wanted to know. In 1996, most newspapers didn't have a "green" section—shucks, in 1996, newspapers still mattered. Now concern over global warming and oil dependency are so common that President Obama speaks about them on a weekly basis, and the first lady keeps a vegetable garden. She's not alone. As phrases like "peak oil" cease to be late-night punch lines, vegetable gardens are once again popping up all over America. Some people hope to shrink their carbon footprint. Some have been terrified by record outbreaks of E. coli as inadequately regulated foodstuffs make their way to the dinner plate. 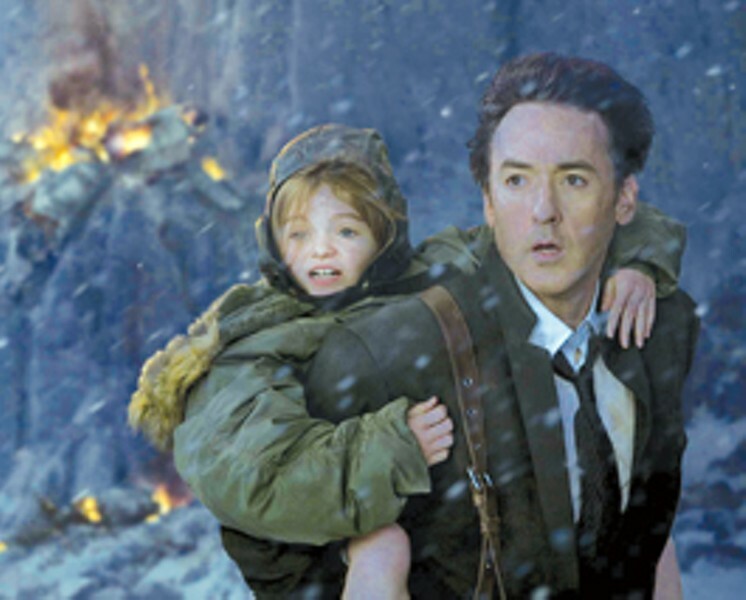 Throw in a few viral outbreaks such as H1N1, a couple of brewing geo-political conflicts, and you no longer need to see John Cusack pitted against giant CGI tsunamis in order to score yourself a boatload of apocalyptic thrills. In time like these, the apocalypse needs a new hero. John-in-a-motor-home, meet Viggo-with-a-shopping-cart. Coming fast on the heels of 2012, a fin-de-siècle shocker keyed to the supposed world end predicted by the Mayan calendar, is the filmic version of Cormac McCarthy's The Road, slated to open Thanksgiving weekend, Nov. 25. The novel, detailing a never-named father and son's journey through a post-apocalyptic America, won the 2007 Pulitzer Prize. It is a quietly devastating book—one that would give you the willies even if it weren't so eerily in step with current scientific forecasts of doom. While McCarthy never names the cataclysm that has rendered his fictional world into a series of "nights dark beyond darkness and days more gray each one than what had come before," the landscape he creates is haunted by present-day anxieties. A kind of nuclear winter grips the planet. Unexplained ash rains from the sky. Plants and seasons have ceased to exist. All animals are extinct and those humans that survive must either scavenge from a dwindling pool of such urban resources as canned food or resort to cannibalism. Daily life in the post-apocalyptic era looks like this: "An hour later they were on the road. He pushed the cart and both he and the boy carried knapsacks. In the knapsacks were essential things in case they had to abandon the cart and make a run for it. Clamped to the handle of the cart was a chrome motorcycle mirror that he used to watch the road behind them. He shifted the pack higher on his shoulders and looked out over the wasted country. The road was empty. Below in the little valley the still gray serpentine of a river. Motionless and precise. Along the shore a burden of dead reeds. Are you okay? he said. The boy nodded. Then they set out along the blacktop in the gunmetal light, shuffling through the ash, each the other's world entire." Computer-generated meteor showers pale in comparison to McCarthy's chilling, stripped-down prose (he uses no quotation marks in his dialogue, as if to imply the uselessness of such formalities in the post-civilized world), and the new movie starring a deeply disheveled Viggo Mortensen and directed by John Hillcoat (of the equally grim The Proposition) looks set to follow in his footsteps. What's even scarier, of course, is that so many of our planet's brightest minds seem to think that The Road, is indeed, where we're heading. From James Howard Kunstler's nonfiction work The Long Emergency: Surviving the End of Oil, Climate Change and Other Converging Catastrophes of the Twenty-First Century, to the writings of award-winning climate-scientist James Lovelock, the doomsday scenarios are pouring in. Just how likely is a Road-like scenario, really? What could cause it? According to the new crop of environmental journalists like Alan Weisman (The World Without Us) and The Guardian's George Monbiot (who has called The Road "the most important environmental book ever written"), climate change is a good place to start. And the scientific community agrees with them. "The earth is about to catch a morbid fever that may last as long as 100,000 years," James Lovelock wrote in The Independent in 2006. In this essay, he declares, "We are in a fool's climate, accidentally kept cool by smoke, and before this century is over billions of us will die and the few breeding pairs of people that survive will be in the Arctic where the climate remains tolerable." Lovelock is known for such pronouncements. In a 2007 interview with Rolling Stone, he predicted that as global warming wreaks havoc on our atmosphere, "extreme weather" will become the norm, resulting in a mass exodus of people as formerly habitable places fall victim to rising tides and the encroachment of deserts. Such migrations, he predicts, will result in epidemics of disease as refugees mingle, killing off all but 500 million people by 2100. As world temperatures shift, survivors will discover that the most attractive real estate is in Oslo (where Lovelock currently resides). This sounds rather like the plot of one of Emmerich's movies, but Lovelock, creator of the electron capture detector, a device which enabled the discovery of dangerous levels of chlorofluorocarbons in our atmosphere and paved the way for the detection of ozone-layer depletion, is not so easily dismissed. He's a former NASA scientist whose work analyzing planetary atmospheres led him to formulate the Gaia hypothesis: a theory viewing the earth as a super-organism, its interconnected systems (weather, energy, plant life, etc.) acting much like an immune system to maintain the planet's equilibrium. If you poison Gaia, say by pumping pollutants into the air, the planet's system of ecological feedback will devise a way to balance the damage. Gaia is a staple of the environmental movement, and though initially dismissed in the 1960s, the hypothesis has gained more respectability in the scientific community as awareness of climate change evolves. The idea that a planet in the grip of a "morbid fever" might attempt to regulate itself through floods, droughts and changing weather patterns no longer seems like New Age mysticism when the U.N. acknowledges (in a recent Associated Press article) that natural disasters like the recent back-to-back typhoons in the Philippines have contributed to food shortages in Third World countries, or when the U.S. Government Accountability Office authors a report warning of increased risk of flooding and droughts across the nation if current levels of greenhouse gasses are maintained. As in The Road, a time might come when a scattered populace, suffering from climactic upheaval, must make their way to safer climes or die. Freak weather, of course, isn't the worst that could happen. In his book The World Without Us, Alan Weisman consults with nuclear scientists and chemical plant inspectors and concludes, as McCarthy has, that in the event of apocalypse a nuclear winter would definitely be part of the equation. The ash that floats perpetually across McCarthy's blasted landscape could be caused by a chain reaction brought on by the failure of the electrical grid. If the human population found itself decimated and no one was left to keep the lights on, Weisman writes, the electronic computer systems we use to regulate our country's oil refineries would also fail. This could lead to explosions, as the pressure exerted by the refining process goes unvented. As Weisman sees it, a "mini chemical nuclear winter" could result from the release of built-up clouds of toxic chemicals. Actual nuclear winter might not be far behind as the uranium contained in the planet's 441 nuclear power plants inevitably succumbs to uranium decay, melting reactor cores and spewing radioactive poison into the earth and sky. If Weisman's scenario plays out, those of us who miraculously survive nuclear fallout and clouds of hydrogen cyanide might encounter actual mutants like the short-lived albino swallows who sprang up around Chernobyl only a year after its meltdown. Such animals have shortened life spans and perhaps die off more easily. This lines up nicely with McCarthy's mythology: there are no animals in The Road, and at times the characters glimpse still-smoldering fires, as of distant machinery burning. Of course, Weisman's experiment is based on the idea that we won't be around to see the end. James Howard Kunstler, author of The Long Emergency knows we won't be so lucky. "I view the period ahead as one of generalized and chronic contraction," he writes. "To put it simply," he writes, "Americans have been eating oil and natural gas for the past century, at an ever accelerating pace. Without the massive 'inputs' of cheap gasoline and diesel fuel for machines, irrigation and trucking, or petroleum-based herbicides and pesticides, or fertilizers made out of natural gas, Americans will be compelled to radically reorganize the way food is produced, or starve." That reorganization, Kunstler posits, will take the form of more centralized living arrangements—the abandonment of suburbia for "easily walkable," close-knit towns and cities, and a focus on small-scale agricultural production among comparatively tiny communities, as espoused by the Transition communities springing up worldwide whose U.S. center is based in Sonoma County. Education, consumerism and all the other normal constructs of society will either cease to exist or take a firm back seat to the production of food and simple survival. Like McCarthy's characters, we will mostly worry about food. Always food. And of protecting what little we have. The competition for resources, Kunstler thinks, will be the scariest part of The Long Emergency. While he agrees with Lovelock that climate change will result in massive loss of life, he predicts even greater strife as oil supplies dwindle and the world's governments vie for control of vanishing reserves. As he points out, much of the world's oil is "located in places where the people hate us." "A military contest over oil," he warns, "could eventually inflame a theater of war stretching from the Middle East to Southeast Asia" as nuclear powers like India, China and America vie for control of vanishing oil reserves. A nuclear war would certainly result in the sort of blasted landscape McCarthy describes—and as bad as that sounds, Kunstler is also thorough in his dismantling of hope on a domestic scale. Post-oil America, he says, could face re-emergence of feudalism as limited resources draw people together in tight social enclaves. "People desperate for legitimate authority to assist them in organizing their survival," he writes, "will probably accept more starkly hierarchical social relations in general and disdain democracy as a waste of effort." Extreme religiosity might also re-emerge as a frightened populace attempts to reconcile previous modes of existence with a new, stark reality. Religion also plays a part in The Road. And here is where the similarities between Kunstler and McCarthy part ways. Despite frequent passages in which the main character curses God and rejects His existence, the spirituality in McCarthy's book is largely positive. In the face of extreme suffering, love becomes the character's religion as the father continually, and selflessly, sacrifices for the good of his son. One would hope that if the ominous portents of Kunstler, Lovelock or Weisman come true, we would also adopt these charitable attitudes. Whatever happens, we can no longer deny we're in for some hard times. At the very least, the world will have to reckon with climate change, which in itself could radically alter how we live. The global financial meltdown has already turned several once prosperous industrial hubs into ghost towns right out of McCarthy's imagination. Science aside, it isn't hard for a growing population of foreclosed-upon families and laid-off workers to imagine themselves behind that rusty shopping-cart. Whatever our own personal suspicions about the end of the world, in times like these we tend to look for people we can relate to. When 2012 opens next week, ushering in the beginning of the fall movie season, less people may be interested in another high-tech, high-octane disaster epic with well-groomed A-list stars. By anyone's standard, Viggo Mortensen's nameless drifter is looking far more relatable. Like us, he's haggard. Like us, he's struggling. And in his careworn face we seem to read a sentiment that all of us share: It's the end of the world as we know it. And we don't feel fine.